how to get this in India or to India, even used or refurbished is ok for me !!!! Hey gud news nokia is working on 2 mhd range meego phones! AnonD-49431, 14 Apr 2012Can U Belive it GUYS ??!?! This Phone was realesed 7 months ago but still has 93% daily Intere... moreits hard to believe still 93%! AnonD-49560, 14 Apr 2012takes little time to get adjusted to the new gestures, but thats ok!! Seeing the built quality... moreWhere did you get N9 from ? Im planning to take one..
beautiful design with great OS! N9 deserve to be a best smartphone!! Anonymous, 12 Apr 2012It was unwise for nokia to have abandoned N9 and meego platform.I very much agree. I'm hoping that Nokia will somehow bring back their support with it once developers show interest. It really has huge potential against Android and iOS even on Windows Phone. 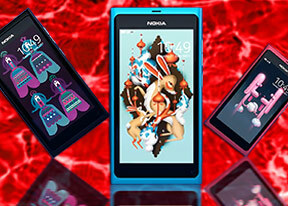 AnonD-50378, 14 Apr 2012The Nokia N9 is by fare one of the best smart phones and possibly the best phone ever, we some... moreTypical "LOVE YOUR OWN" mentality. sure you'd say nice things about the phone you just paid top money to buy. else, you'd feel bad about shelling out money for a phone that's not even close to being the top of line. to set you straight, you probably have not experienced the other better phones out there. iPhone, s2, galaxy note, htc one x, etc etc. Sir, i tell you, once you've experienced those, you'll never want to touch your NOKIA N9 anymore. I'm sorry to tell you that you could have bought a better phone with the money you spent on this.